"Moral reasoning involves a complex integration between affective and cognitive processes that gradually changes with age and can be viewed in dynamic transaction across the course of ontogenesis. The ﬁndings support the view that negative emotion alerts the individual to the moral salience of a situation by bringing discomfort and thus can serve as an antecedent to moral judgment." Children as young as 6 months seem to preferentially interact with people who help and altruistic behavior can be seen in early childhood, but developmental steps, biological underpinnings, and individual variations are not well understood. This study (age 4 to 37 years) provides insight into the complicated brain dance of perception, emotional response, and empathetic concern when viewing unintentional and intentional hurtful acts. All age groups reported feeling sad and upset when viewing intentional harm and harm directed toward people vs. objects. 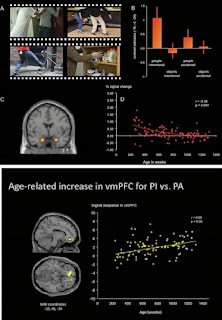 Emotional responses were similar in young children as adults, but amygdala activation was greater - the adults were better able to turn down amgydala activation compared to younger children. What being older also seemed to help with was distinguishing accidental from intentional harm (children tended to view all harmers as 'malevolent'). The study made us think of children (like those with sensory processing disorders) who struggled with empathetic behaviors although their emotional reactions and mirroring seemed normal. The perceptual side of empathy was intact, but the intensity of emotion reactions and cognitive decision making immature. On the flipside, other children might reason well about empathy, but have blunted emotional responses. The behaviors could look the same, but causes and interventions would be completely different.